Objectively, How Thin Or Thick A Line Do You Require Your Nibs To Produce? Given the absence of authoritative and/or industry standards for nib width grade (Fine, Medium, Broad, etc.) definitions, as well as agreement and common understanding among fountain pen users at large globally, perhaps a better way to look at which nib an individual user and/or buyer 'needs' is to examine the minimum and/or maximum line width(s) in terms of objective measurements, such that it would be fit for a particular purpose (or acceptable as 'general purpose') to him/her. For me personally, I've often stated that my test for a pen and nib's fitness for purpose (as a 'general purpose' writer used in everyday applications) is whether I can write in traditional Chinese legibly within a 5mm grid, which is the most common spacing for line-grid and dot-grid journals and notepads on the market. But what does that actually mean, especially if I have to explain it to someone who is not familiar with the appearance and structure of the most common two or three thousand traditional Chinese characters? I most commonly use the Chinese (as opposed to, say, Sanskrit) text of the Heart Sutra when I do writing samples, just as I typically use the text of the papal bull Inter Gravissimas for writing samples that use Latin-based characters. Let's look at the first character in the Heart Sutra: 觀. 觀 is a fairly commonly used character in Chinese outside of Buddhist sutras and texts; it appears in the Chinese words for objective and its opposite subjective, views, opinion, optimism, appearance, observe, sightseeing, Taoist shrine, and so on. Furthermore, the left half of that character is a component of quite a number of other common Chinese characters such as 歡, 灌 and 鑵. In order for me to write 觀 (and any other Chinese character that contains the left half of it) legibly, I must be able to draw in sixteen parallel, (nearly) horizontal partitions inside the em-space, either deliberately putting ink in a partition or deliberately avoiding putting ink in one. A loose equivalent to that would be being able to draw within the height of the em-space eight distinct, parallel, horizontal lines that are cleanly separated. I also need to factor in enough spacing between two consecutive lines of writing to provide clear delineation, so let's make that nine horizontal lines (and eight 'white' lines of empty space separating them, preferably followed by a ninth as well). Let's assume for now that the whitespace between two parallel lines of ink ought to be at least as wide as the lines themselves, in order to make their separation visually distinct. Therefore, each horizontal line of ink should nominally be no wider than one-seventeenth to one-eighteenth of the grid size being used. Using 5mm grid paper, that works out to approximately 0.28mm. The line width requirement for parallel vertical lines inside the em-space is less stringent; seven to eight lines will generally suffice. Any pen – in combination with the specific ink and paper used, as well as limited by my own handwriting technique and hand-eye coordination – with which I cannot draw nine distinct parallel lines within the em-space is not fit for the purpose of 'everyday' writing for me. So that's the rule-of-thumb test I tend to use now, including when testing inks to see whether they're acceptable for use with certain pens I have. Also keep in mind that 觀 is hardly one of the most complex or stroke-dense traditional Chinese characters. (It's not even as complex as one of the characters in my given name, which thankfully I don't have to write very often these days.) However, using a character such as 齉 at every turn as the standard for testing could be a little unreasonable; we don't talk or write about nasal blockage every day. Interestingly, even though Japanese fountain pen manufacturers often use inscriptions of F, M, B, etc. on the nibs to denote their width grades, in Japanese the grades are actually denoted 細字 (small characters/ideograms/symbols/glyphs), 中字 (medium-sized characters), 太字 (large characters), etc. correspondingly. In other words, the user nominally selects a nib based on how large his/her handwriting is for a given purpose, and not how wide the nib tipping is or how wide a line it is apt to produce on the page. 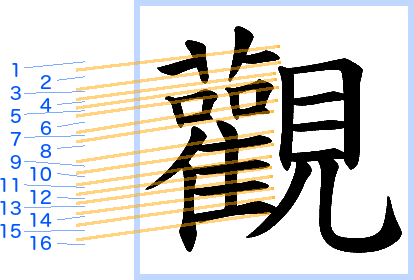 I'd be happy to agree that, by most people's standards, writing Chinese hanzi or Japanese kanji in a 5mm grid, especially without whole lines of whitespace of that height in between lines of writing to aid legibility, is very small handwriting – 極細字 – which 'translates' to Extra Fine in terms of nib width grade (although I'm often able to do it with Japanese nibs that are classed as F nibs). Edited by A Smug Dill, 17 February 2019 - 09:28. So, how thin or thick a line do you require your nibs to produce for your specific purposes? Just to pre-empt: with all due respect, I'm not dismissing 'chasing' shading and sheen as less legitimate or less worthy uses of fountain pens in this hobby – far from it – but preaching, “the wetter the better, the broader the better, the more line variation the better” would not be really helpful. I'd be more interested to hear if a minimum downstroke line width of, say, 0.9mm is required for your choice of inks to manifest shading on your choice of specific papers, or that you (or whoever you intend your handwriting for) cannot see with unaided eyes the effects of sheen, due to physiological and/or perceptual limitations. Or that, say, only 50% of your inks will show shading when the line width is 0.6mm, but 80% of your inks will show shading at 0.8mm, and you have set a minimum threshold that at least 60% of your inks must show shading when used with a particular pen, for that pen and nib to be considered fit for purpose (as opposed to what is 'best'). For my typical writing, I use 8mm lined or 5mm dot grid. Above about 1.5mm with an edged nib & about .9-1mm round, my cursive legibility suffers without enlarging to give things more breathing room. Below that. Depends on what I write for. For B5 papers in a journal, I find Pilot EF, F, SF, Platinum 3776 SF, Preppy F, Pelikan M200EF, F, Sailor 14 and 21k F and MF good. Quite a huge range of line widths here. But all on the finer side. It also depends on what ink and paper I use. For Rhodia, many of the fine nibs turn out way too thin and inks too pale. I enjoy rather absorbent papers for such writing. I have everything from a Platinum UEF where I am practically able to write the words of The Bible on a grain of rice to a wet Broad Pelikan M1000 where I can paint on poster board the name of my lemonade stand for advertising and much in between. I continue to practice writing bigger with my big nibs as I tended to write small when I first got into fountain pens. Writing bigger has been fun to learn... now working on writing as small as possible with my broad nibs while keeping all my vowels ‘open’. My broader nibs tend to be wetter and show much more ink characteristics, which is also appealing to me. I like to use Western Fine or thinner when I’m jotting down notes and/or writing quickly. Maybe my next objective is to learn how to write beautifully with consistent stylized letters which many on these forums seem to do. I’ve not yet mustered the patience to learn how to do that, but that may add a whole different perspective on what nib size I prefer. I suspect thinner with line variation would be ideal... I have a vintage Geha 790 extra fine flex that may end up being a go to pen for that. In summary. Things continue to evolve as my skills evolve. In all companies use their very own standards...and different era's use different standards. Broad is wide....even in Japanese. BB is something one don't have to really worry about in Japanese....same with BBB. Which IMO is too wide to really write with .... pure signature. B-BB is not really for lined paper unless you line your own paper with free templates. The e gets drounded too easy in regular lined paper. M is medium....even in Japapese......but not in Euro where is it @ an F....With so many folks chasing super skinny nibs an Euro F is a medium nib to many. If one crosses companies standards and eras....a Euro F can be a F-EF.....real easy....can be a F-M just as easy. I don't think numbered nibs are going to be any more exact than the lettered nibs really. A 1.0 can just as well be a 1.1 or a 0.9, and be well with in tolerance, even before paper, pressures and ink. Medium Euro is hard to use in a collage lined page in the E's tend to close.....one should pick a paper for the width of one's nib. F/EF...or Japanese M/F can be used in collage lined paper and not close the e.
Comes down to what paper and how wide a line one uses. If one uses a printed script or a more flowing cursive script. Western Italic is fatter than oriental printed scripts. One can chose if one wants to play horseshoes or hand grenades for what width is what. A long time ago, I gave that BS up, in due to company standards alone.....not even taking normal tolerance/slop into account..............there is nothing but 1/2 size nibs in the world. Japanese nibs do run narrow......to a western nib user. Western nibs are all fat to those who started with Japanese. Each's eye was calibrated differently. And so will remain. Nibs are very, very skinny (baby spiderwebs); very skinny (spiderwebs), skinny, middle skinny, medium, medium broad, broad, very broad, very very broad and heading nibs. One applies one's Japanese standard, or one applies ones Western standard....and will be wrong to half the people in the world. Add what era....and you lose another chunk of the world. In the '80-90's before Japanese pens crept out of Japan. Conway Stewart was by far the widest nib in the world. Parker was wider than Sheaffer. The narrower Pelikan had two widths, a wider one for the 400 and a narrower nib for the 800. Waterman had an even narrower nib...............all but in EF where Pelikan was the narrowest of all. Now it's a different era....and narrow Japanese lovers say a modern Pelikan EF is an M..........In Japanese maybe, depending on if it's a fat Euro EF or a thin EF. what side oof the modern tolerance it is. So Do Look for Pelikan's EF in semi-vintage and vintage for a true EF.....well true western EF. One can not use a skinny nib on Laid or Lenin Effect paper. Western M/Japanese B is good on them. The only thing one can do if one worries about pure size instead of 1/2 sizes is to send all one's pens to one and only the same nibmeister to have them ground to your and only your very own standard. Is the nib skinny, does it write well. The nib is not as skinny as marked....it writes well. If it don't write well, sell it. Everyone knows Japanese make skinnier than marked nibs. Everyone knows Western nibs are fatter than marked. ...........................OK.....I don't print, so don't need a skinny Japanese nib. If one needs a needle nib, they make them. I write cursive so need a fat western nib....and I do find western EF narrow enough. (Prefer western F&M) If one wants a real fat nib, Japan don't have any one has to go B or wider in European. I've come to like western M quite a lot...in my 200's (same half a width narrower as vintage and semi-vintage) so that is a M-F.....hey... a half size. Edited by Bo Bo Olson, 17 February 2019 - 13:42. Along with the line width of the pen, there is a balance of the size of the page and the margins. On smaller paper I use a finer pen and write smaller. On larger paper, I use a broader pen and write larger. I prefer blank paper and stubs. I have pens inked between 1.0 and 1.9 and never use smaller than A5 paper. Fine print and long line length does not make for easy reading, at least to me. For my most usual writing and note-taking, I need a pen that will allow me to write legibly, in either print or cursive, within the grid of my Hobonichi Techo planner. For this purpose, a Western F nib or anything finer is suitable. I need some pens that dispense less ink, for making annotations on computer printouts or writing marginalia in books. A Japanese F nib or anything finer works well for such applications. I have a few pens with wider nibs for addressing envelopes and parcels. The Japanese calligraphy I practice requires a brush. For different purposes, I use all sizes from 0.3mm to 1.1mm in line width. I have no one size that I rely on more than any other; I have many different writing needs and interests. I like variety and change. I write only in English, and I do not draw or make artwork. For different purposes, I use all sizes from 0.3mm to 1.1mm in line width. I have no one size that I rely on more than any other; I have many different writing needs and interests. I like variety and change. +1. Aesthetically, I prefer the openness and the uncluttered look of a page full of thin line widths. However, some pens make my writing look good and some pens make it look bad and there's no real correlation to nib size. My old PFM-III M writes a wide line, but never before did my writing look so good. Same with my '48 Onoto 5601 with #3 nib, which is a gorgeous, narrow stub that just enhances everything I try to do. Other contenders for neat script are my two Leonardos and my Homo Sapiens, all F's. At the end of the day, the pen seems to choose me, not the other way around. I have a very light touch, so I have a hard time getting line variation out of my exclusively vintage pens. I’ve had dip nibs dropped into some of them, which is perhaps an extreme solution to a very First World problem. Richard Binder on his site has a nib width chart, that use to be well used, before he retired by those very interested in how wide their narrow nibs were. I've not seen any reference to it, lately, even if it's still there. Those into medium and wide nibs seem to have less interest in how much of a hair that has been split. Very few my B is actually an M-B!!!! Complaints. Yikes! That is some variation! There's more to it than just the tipping amount -- it may be that the tipping itself is not ground/tuned identically on the two pens. I had a Pelikan M200 with a broad nib and it had to be tuned by a nibmeister because it skipped so badly. After I lost the pen, I was able to get another one and then bought a broad nib for it that was tuned on the spot when I bought it -- and it was a GREAT writer. Same brand, same model, same nib material and nib width (the original nib on the second pen was described as "wide" -- what it was in fact was an IM and it was a firehose (even by Pelikan standards of wet). At the moment, I've stuck it on my other M200 and put 4001 Brilliant Black in the pen -- and that curbed the wetness of the nib very nicely (I needed to do a calligraphy project and that was the best way to do it: ink up the pen with that nib and that ink, do the writing on good paper, tape the sheet to a Lightbox, and then trace over it with a craft brush and slightly diluted paste food coloring onto edible wafer paper). But once the pen is flushed out, I will likely put the original M nib back on the pen (I don't need that IM nib very often). ETA: After posting, it occurred to me that since I don't own either of those pens, there may *also* be differences due to the price point overall all. There may also be differences as to when the pens were made (vintage pens in particular often tend to have narrower nibs as far as the line made, as opposed to modern pens of the same brand) or (for some brands) where the pen was made. Add into all of that mix that the nibs likely were finished by hand, by humans (not robots or computerized equipment) -- and there's even that someone just screwed up and mis-labeled the nibs. Edited by inkstainedruth, 18 February 2019 - 21:47. Also keep in mind that 觀 is hardly one of the most complex or stroke-dense traditional Chinese characters. Writing 鬢 is far more challenging, even though it only comprises 24 pen-strokes (as opposed to 36 in 齉). It requires about 24 to 25 horizontal partitions of the em-space, or as a loose equivalent, drawing 13 distinct parallel horizontal lines with a steady hand, so the line width cannot be thicker than 0.2mm. Thanks. Are those line widths expressed in millimetres, centimetres, or some other unit of measurement? I have many nib widths. Generally, I prefer stubs and italics. I have a fairly light touch to my writing so line variation for me comes from the stub or italic. Also, whatever the nib size, I do not like too much feedback and never scratchiness. I want my nibs to be smooth. I don't mind hearing feedback, but I don't want to feel it. Whatever nib size, I strongly prefer wet nibs that lay out an ample amount of ink. I have spent a fair amount of money on ink, so I want to enjoy writing with it and enjoy seeing on the page. What does this mean in terms of "nib width"? I prefer to see a page with writing that shows variation and personality than spidery homogeneity. Thank you for everyone's input. That's not really the question, though. How thin or thick do you require the lines to be, irrespective of how the nib width is graded and/or marked? Do you need the thinnest lines on the page to be no more than 0.25mm wide, and the lines drawn perpendicularly to be 0.75mm or wider, to yield the level of line variation you require for your normal handwriting size with the same nib? Or 0.38mm ('Chinese Fine') vs 1.0mm (roughly Double Broad) in orthogonal strokes? No thinner than 0.2mm because one's preference for lighter-coloured inks will not produce an easily visible line at such line widths? Even as I'm looking at books on English calligraphy now, there are general guidelines that for Italic writing, the x-height is equal to the height of ascenders as well as that of descenders, each being nominally five 'nib-widths', so 15 equal horizontal partitions of the em-space should be the line width produced by a suitable nib (at its widest). Taking into account interline spacing, we require 17-18 horizontal partitions, so writing on 7mm ruled paper on every line would require that the Italic nib produces a line width or 0.4mm or less. If one wants the widest part of the stroke to be at least 250% the width of the thinnest part of the stroke, then we're talking about a nib that produces 0.4mm in one direction and 0.15mm orthogonally. That's what I'm trying to explore, what others' line width requirements are, especially if they only or predominantly write in English, whether they prefer to write in Italic, Copperplate, Spencerian, American Cursive or whichever hand(s), before looking at which nibs on the market are fit for the purpose. I'm trying to understand what others do technically, and/or in terms of actual technique to produce the writing outcomes and/or artistic expression they individually desire, and the tools required to mechanically execute their techniques (on the papers and/or media of their choice). As some of you have alluded to, or outright stated, the individual may not actually have a strict requirement (or acceptable ranges) with regard to line widths, and that's perfectly cool. On the other hand, if someone makes eliciting shading a priority in terms of artistic/personal expression in writing, but for his/her choice of inks shading would not be sufficiently evident (the way he/she looks at it) until the line width exceeds x millimetres and thus it is a de facto requirement, that would be very informative. Edited by A Smug Dill, 19 February 2019 - 02:27. Picture Sample Of My Handwriting. What Style Is It? How To Improve? What Method?